This video is an excerpt of a chat with Jonathan Crow, who took our How to Sell Your Art Online course. You can learn more about the course at this link. My questions and summaries of Jonathan’s responses follow. 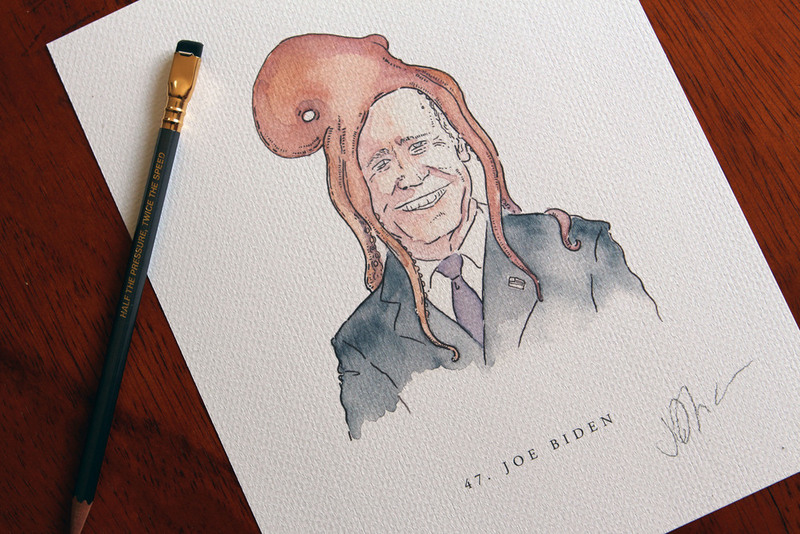 Jonathan Crow is an illustrator most known for his Veeptopus drawings – pictures of Vice Presidents of the USA with octopuses on their heads. Where was your art business before you took How to Sell Your Art Online? Jonathan had received a lot of press in 2014 from sites like Boing Boing. His Etsy sales were doing really well, but they started tapering off. He didn’t know what to do to revive those sales. Jonathan pointed out that he had heard many of the things in the course before, but having a consistent structure got him to actually do the work. What does your art business look like now? He’s doing a Kickstarter campaign. You can see it here. He successfully raised $15,137. More than enough to get his book printed and shipped. Part of the reason his Kickstarter campaign was successful was because he was promoted at the top of his category on the website, and also made it into a few emails to the Kickstarter mailing list. That took him from 40% to 80%. Jonathan had conceptualized the book a while ago, but he had a challenge figuring out how to turn it into a book that the publishers would publish. After several rejections, he decided to self publish. Part of the reason that his idea worked was because it was a clearly conceptualized concept that just needed funding. If someone were thinking about taking the course, what would you say to them? It depends on where they are in their career. They could probably get something out of it on any level. The first third works best for people who are just getting started, people who are drawn to making art but don’t really know why. The third part is even more of that. We took a slight detour to talk about how Kickstarter’s curation process, and how Jonathan took advantage of that. We referenced my interview with Willa Koerner, Kickstarter’s Head of Curation. Want to do what Jonathan did to get these results? Check out our How to Sell Your Art Online course. I love these successful stories, especially because it’s very difficult to succeed in art business. I’m happy to see that people like me made it. I am curious about this course, and I believe I will try to get it too.